With Halloween around the corner and the weekend almost being there we are updating the game once again. 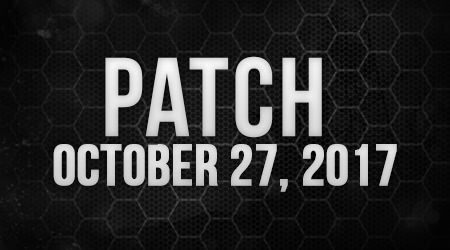 This patch is mainly to add all the Halloween-event related stuff but at the same time we are patching in a lot of fixes, some new items and some major changes to the Battle Royale game-mode. We would like to adress you that the estimated size of this patch is around 1300 mb. Before you jump into these patch notes, check out this video covering the patch notes by our developer: Sven. Players can no longer take the "Vss Compact" into sniper only servers. The clan list now sorted in alphabetical order. Decay has been added to the in-game weapon / item statistics. (Decay is used to refer to the distance a weapon starts losing damage. If a gun has a decay of 500, the damage from it will start decreasing after 500m. This statistic has ALWAYS been there, but now it's going to be shown on the UI). The "Learn Skin" button in the main menu UI now indicates if a certain skin is already learned. When a skin is already learned the button will be more greyed out. This way players know what skin recipes they already learned easier. Clicking on community will now take you to leaderboards by default. (If a game-mode has been selected). Fixed a common crash related to players exiting their game. Fixed a bug where sometimes a lot of icons would stack in your quickslots. Fixed an issue related to setting sensitivity. Sensitivity no longer automatically changes. Fixed a issue in the Survival game-mode server list preventing recent /favorite lists from saving. Fixed a small UI visual bug related to "one moment please". Fixed various crashes related to the anti-cheat. Fixed a major issue related to dropping FPS / performance when players throw grenades or other throw-able objects. We are happy that this major and common issue has finally been fixed! Various issues have been fixed related to the Open World ranking system. Servers that affect a player's rank now have a new icon (next to the ping limit icon) that indicate that this certain server is affecting a player's rank. The player's rank icon (of the current rank he has) is now also displaying in the in-game UI. This way the player can always see what rank he is but he will also know that when this rank icon is displayed he is playing in a server that affects his rank. COMING SOON: We plan on adding it so that other players can see (for example in the in-game players list) what rank every player is. We plan on doing this with for example a border around a player's nameplate. Stay tuned for this. Spring Valley has been added. Clear V2 has been removed. Updated blood splats: When players hit other players / zombies with a melee there's now a different blood splat. This to add more variation and have a difference between the impact of a bullet and a melee. The airdrop system has been re-coded and majorly improved. Incoming / landing airdrops are now more optimized. Updated "unarmed" impact sounds. When hitting any terrain now with bare hands instead of playing the default sound there's now new sounds. This makes more sense and makes the game more realistic. Added: Unique unarmed hit sounds for players hitting player bodies / zombies. Added: Unique unarmed hit sounds for players hitting concrete. Added: Unique unarmed hit sounds for players hitting gravel. Added: Unique unarmed hit sounds for players hitting dirt. Added: Unique unarmed hit sounds for players hitting grass. Added: Unique unarmed hit sounds for players hitting mud. Added: Unique unarmed hit sounds for players hitting metal. Added: Unique unarmed hit sounds for players hitting wood. Added: Unique unarmed hit sounds for players hitting water. Added: Unique unarmed hit sounds for players hitting sand. Added: Unique unarmed hit sounds for players hitting rock. Added: Unique unarmed hit sounds for players hitting ice. Added: Unique unarmed hit sounds for players hitting glass. Added: Unique unarmed hit sounds for players hitting rubbish. Added: Unique unarmed hit sounds for players hitting snow. Updated "melee" impact sounds. When hitting any terrain now with a melee instead of playing the default sound there's now new sounds. This makes more sense and makes the game more realistic. Added: Unique melee hit sounds for players hitting player bodies / zombies. Added: Unique melee hit sounds for players hitting concrete. Added: Unique melee hit sounds for players hitting gravel. Added: Unique melee hit sounds for players hitting dirt. Added: Unique melee hit sounds for players hitting grass. Added: Unique melee hit sounds for players hitting mud. Added: Unique melee hit sounds for players hitting metal. Added: Unique melee hit sounds for players hitting wood. Added: Unique melee hit sounds for players hitting water. Added: Unique melee hit sounds for players hitting sand. Added: Unique melee hit sounds for players hitting rock. Added: Unique melee hit sounds for players hitting ice. Added: Unique melee hit sounds for players hitting glass. Added: Unique melee hit sounds for players hitting rubbish. Added: Unique melee hit sounds for players hitting snow. Updated "melee sharp" impact sounds. When hitting any terrain now with a sharp melee instead of playing the default sound there's now new sounds. This makes more sense and makes the game more realistic. Added: Unique sharp melee hit sounds for players hitting player bodies / zombies. Added: Unique sharp melee hit sounds for players hitting concrete. Added: Unique sharp melee hit sounds for players hitting gravel. Added: Unique sharp melee hit sounds for players hitting dirt. Added: Unique sharp melee hit sounds for players hitting grass. Added: Unique sharp melee hit sounds for players hitting mud. Added: Unique sharp melee hit sounds for players hitting metal. Added: Unique sharp melee hit sounds for players hitting wood. Added: Unique sharp melee hit sounds for players hitting water. Added: Unique sharp melee hit sounds for players hitting sand. Added: Unique sharp melee hit sounds for players hitting rock. Added: Unique sharp melee hit sounds for players hitting ice. Added: Unique sharp melee hit sounds for players hitting glass. Added: Unique sharp melee hit sounds for players hitting rubbish. Added: Unique sharp melee hit sounds for players hitting snow. Updated / Added more sound variations for the female breathing state. Updated / Added more sound variations for the male breathing state. Updated / Added more sound variations for the female wounded state. Updated / Added more sound variations for the male wounded state. Updated / Added more sound variations for the female in pain state. Updated / Added more sound variations for the male in pain state. Updated / Added more sound variations for the female jumping. Updated / Added more sound variations for the male jumping. Updated / added footstep sounds for the ice terrain type. This terrain is not really used in any maps yet but it now has it's own footstep sounds. Fixed a texture issue related to the "White House" building where sometimes a part of the building would not load textures. Fixed / Improved the "Motel" building (located close to the beach). Improved the model so players can no longer glitch and look through the building. Fixed the "Trailer Truck" model where players were able to glitch inside in. Players are no longer able to do this. Fixed an "Arab Shop Building" where the staircase hole wasn't big enough for a player to go through. Also improved some doors. Fixed some "Arab" buildings. Some of the buildings were incorrect size. Fixed an issue related to some highway bridge models where players could glitch into the side. Fixed the G11 Ammo. The ammo has now weight. Fixed the "Riot Shield Kazakhstan" place-down issue. The Riot Shield works normally again now. Fixed / Improved the "Ballistic Shield" textures and materials. Updated the store icon of the "Ballistic Shield". Added a new item: "Ballistic Shield Halloween". This item will be released during the Halloween Weeks event. Added a new item: "Battle Axe". This item will be released during the Halloween Weeks event. Added a new item: "Scythe". This item will be released during the Halloween event. Added a new item: "Ghillie Suit". This item will be released in the Survival game-mode. Later on this item will also be available in the Open World game-mode. Reduced the spread of the "FN57" from 2.4 to 2.2. Increased the grenade / bada boom damage area. As of right now the grenades in-game can be considered "useless". Players often don't care about walking straight into an explosion since it only takes a part of their HP. Grenades should be better in general and if a player is close enough to the explosion take major damage. We will keep changing the statistics until we find the right balance for these explosions. Fixed the "Erckul's Sub Wand". This melee is now glowing. Fixed the "Heavy Armor GamerKrissy". Fixed some texture and model issues. Did some improvements. Fixed the "Heavy Armor Fallen Angel". Fixed some texture and model issues. Did some improvements. Fixed the "Heavy Armor Fallen Angel Chrome". Fixed some texture and model issues. Did some improvements. Updated the "Blaser Valentine" texture. The skin now looks more shiny and better overall. Updated the "OTS Modern Black" texture. The skin now looks more shiny and better overall. Major tweaks / updates have been done to the military loot. Loot in these categories should now be 10x more variated. Players reported to find a lot of the same items at for example military road blocks. This has now been majorly improved. Major tweaks / updates have been done to the crashed helicopter loot. Better weapons have been added. Bad weapons have been removed and better ammo has been added. If players want to find ammo with 100 bullets chances are highest at helicopter crash sites. Medical items have been added / increased in every loot table. This is only for lower graded medical items like painkillers, bandages and antibiotics. Repair kits and gasoline has been added / increased in the garage spawns. Also decreased stuff like oil. Military Backpack chances have been added to the super zombie loot. The new added item: "Ghillie Suit" is now available and spawning in the Survival game-mode. Remember those "Old Infestation" random scary sounds that were in original Colorado V1. These sounds would scare the hell out of players and were something our community has been asking for since the beginning of New Z. We have done some new research and we've finally been able to add these sounds back! Cool to know is that we haven't only added the old sounds back; we also added new sounds! For now the scary sounds will only be present in survival. They're definitively worth to check out and we're very happy scary sounds are finally back! Decreased the overall amount of sprinters in the map. The entire Battle Royale game-mode user experience has been improved, optimized and reworked. We have major plans for the Battle Royale game-mode such as a lobby system that allows players to play with their friends and invite them in a lobby. Expect more to come soon! When a Battle Royale starts we have added a "in between" screen that takes the player from the lobby to their starting location. This is done using a camera system where the camera kind of fly's to the player's starting position. In this "in between" screen we've also added a countdown that counts down from like: "3, 2, 1, fight!". This countdown also has new sounds. The "safe zone dome" has been reworked and optimized. There was some problems with the old dome and it didn't look that good as we want. The new dome looks way better overall and is also more optimized. An "end screen" has been added when a player dies. This end screen displays what place the player ended up, what his rewards are, what progress he has made on his rank and overall statistics from the Battle Royale game he has played. More statistics will be added later on. Zombies in Battle Royale will now only start spawning once the first radiation is released. This gives players the opportunity to find better gear before the zombies and radiation spawns. We think this will make it easier for players to play Battle Royale and improve the overall experience. COMING SOON: A new Battle Royale map. We just want to let you guys know that we are working on a brand new Battle Royale map. We would like to "step up" our game with this new map and introduce a whole new level of game-play for the Battle Royale game-mode with this map. Stay tuned for this! Fixed some flying trees in some military area's. Added some drive-able cars (car spawns) to the loot tables. Fixed a no-clippable tree around the crash site. Added some special dedicated secret spots for the Halloween Weeks. These secret spots are have a Halloween theme. Fixed the an issue related to the flares at the helicopter crash next to Tyler Ranch. Fixed some spawns at the airport where players would sometimes spawned inside some rocks. Fixed an issue related to the police station in Death Valley where footstep sounds would not always play. Deleted some flying objects in Boulder City. Night time has been updated and night time is now a little bit darker. Fixed / updated the minimap. Updated some collision walls that were indicated wrong on the minimap. Fixed the render distance of some small objects. Fixed a terrain issue at the beach. Fixed some flying objects around the beach. Deleted the un-optimized trees from the map. Replaced them with some better new ones. Updated the sand terrain with a new texture. Freeze time has been disabled based on community requests. Re-painted some terrain and updated some textures to make the map look better. Fixed the problem with the bus stations. Estimated patch size: 1200 mb. PLEASE KEEP IN MIND THIS PATCH IS BIGGER THAN ANY USUAL PATCH WE DO. I'm a big fan of yours. Can't wait to play tomorrow! Have you reported on our forums what's the issue here exactly? Please make survival harder. not easier. Why no zombies at start of br : ( we make fun of those pansies that play other battle royale games because they don't have to worry about zombies. It's a zombie game. i have played at last count 600 or so games of. Don't nerf Zombies in BR : ( thank you guys for everything else though and i can't wait for the new map and the spooky sounds!!! drown us in ambiance!!!! : D Thanks !!! cant wait to hear the new sounds either. i am so glad yall aint ignoring that aspect of the game. is really exciting!! So excited to see this patch, the burning building with smoke looked freaking insane!!!!!! Question: you mention weapon decay....but no way to repair it? I hope this isnt for Survival, hard enough to get good guns. Nobody wants decay... makes game tedious, especially for survival when loot is few and far between. Plus now GI's are going to look like a mess if they don't stack.